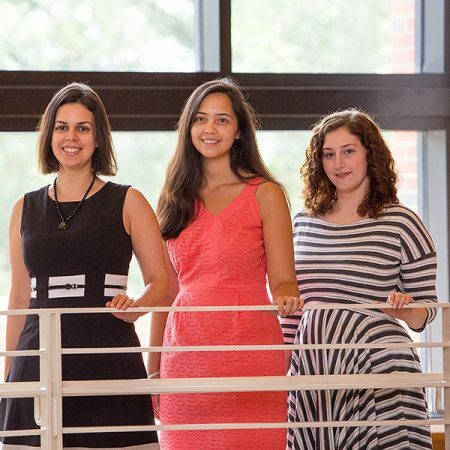 Assistant professor Lara Perez-Felkner, Samantha Nix, Kirby Thomas. The belief that the ability to do difficult mathematics is something that you either have or you don’t prevents many American girls from pursuing a college degree in the physical sciences, engineering, mathematics, or computer science (PEMC), suggests a new study by Florida State University researchers. Perceived ability in mathematics matters, in particular on difficult and challenging tasks. While high school boys tend to overrate their abilities in mathematics, girls tend to underrate them. They also found 12th grade girls who reported being convinced that they could do the most difficult and challenging mathematics were about two times more likely to select a PEMC major. Another important conclusion was the perception that mathematical ability can be developed through learning — or a “growth mindset.” Girls in 10th grade who reported that they felt confident about this were more than two times more likely to take a PEMC major. To conduct the U.S. National Science Foundation-funded study, researchers examined a group of 4,451 students from 752 high schools across the United States and followed them from 2002 to 2012 using the records of the Education Longitudinal Study of the U.S. National Center for Education Statistics. These findings, published in the journalFrontiers in Psychology, have direct implications for policy.